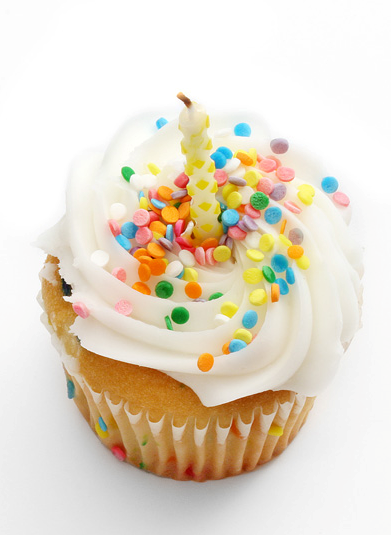 To 10,000 people I’ve turned one! mmm, this picture makes me feel hungry. Click image to link to the source. Today I reached 10,000 (ok, it’s past 12:00 so I guess it was technically yesterday and the number was actually 10,044) individual user sessions and at the same time I reached one year of blogging (um, this milestone was really reached a few days ago but I only twigged on now). Thanks for reading, commenting and occasionally hitting me with blunt phrases. This is the longest I’ve gone with nothing to say. *blush* OK, I admit, I have plenty to say but I’ve been gagged. My PC crashed, I went from XP to Windows 7 and my 3G card isn’t compatible or something so I’m left without internet access at home. Hence the time of silence. I’ll be back, just not for a while. Everyone likes a bit of advertising. Fav my blog on Technorati and you’ll make my day. Click here for some more information. I’ve been blogging since the 19th of February 2009. I’ve published 106 posts. In all that time my Technorati authority has not moved. Not even one notch. I read this afternoon that Carpenter’s Shoes‘, a blog I follow, Technorati authority has been fluctuating between 700 and 120. Well done Jenny, but seriously, what have I been doing wrong all this time? 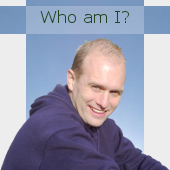 I’ve gone to Technorati, deleted my current blog and am attempting to recreate a new one. Let’s see if I get anywhere. What’s the audio player button all about? 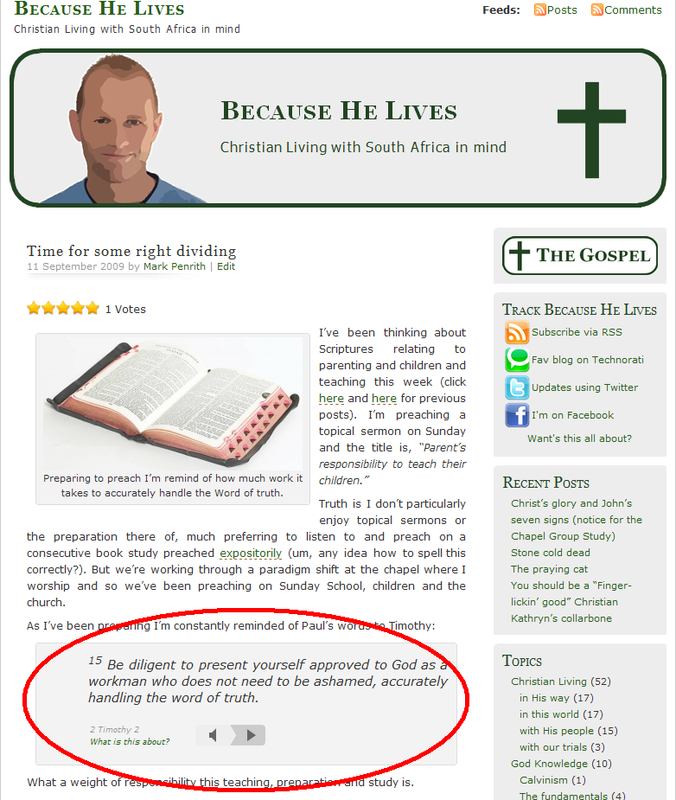 An exciting new feature on Because He Lives brings the reader closer to the text by making them a listener. Click image to enlarge. 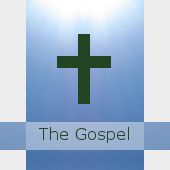 If you’ve read this blog for any length of time you’ll know by now that Scripture is very important to me. I normally write a story, it has a bit of dialog, maybe a few pictures, a probing question and almost always a single Bible verse. Here’s my problem though, I hate quoting a verse because mostly proof texting is done by stuffy academics or nutty liberals and I’m neither (maybe in time I’ll turn out to be a nutty academic). Context, when anyone comes to Scripture they have to be concerned about context and my format doesn’t allow for that. So I’m really excited to bring a completely new feature to the blog Because He Lives. Under each verse is a little play button, if you click it you’ll have the opportunity to listen to the entire chapter that the verse quoted is found in. That means that if you’re interested in the post you’ll be able to ensure the contextual integrity of what I’m saying. Maybe as a sidebar, this is all recordings that exist in the public domain, so they’re free to listen to and free to distribute. It’s going to take me a while to roll it out to legacy posts but I will. Scripture is that important. Oh, maybe I should have noted that the version I’m planning on using is the American Standard Version. Any comments? How important is the integrity of the Word to you? What are the “Track Because He Lives” buttons all about? So I’m slowly coming to grips with the technology of blogging. It’s not a difficult thing to get into but it’s rather harder to understand the ins and outs of how it works. Over a period of time I’ve begun to put a few helpful ways of interacting with this blog together. I thought a post explaining the basic technologies would be helpful. 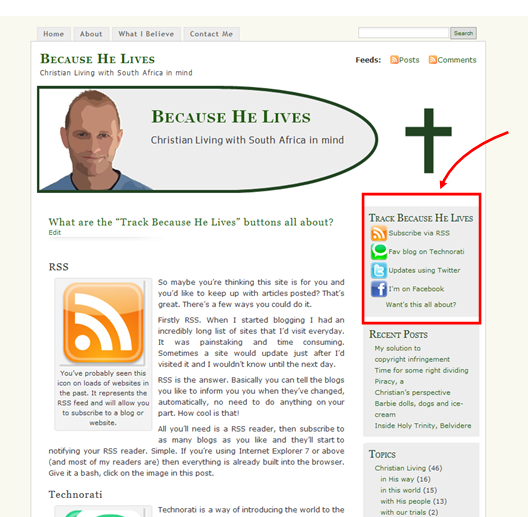 If you blog about Christianity in the South African sphere drop me a line through the Contact Me section if you’ve got any questions relating to what works and what doesn’t. Also if you’ve got some advise for me jot a note down in the comments section. You’ve probably seen this icon on loads of websites in the past. It represents the RSS feed and will allow you to subscribe to a blog or website. So maybe you’re thinking this site is for you and you’d like to keep up with articles posted? That’s great. There’s a few ways you could do it. Firstly RSS. When I started blogging I had an incredibly long list of sites that I’d visit everyday. It was painstaking and time consuming. Sometimes a site would update just after I’d visited it and I wouldn’t know until the next day. RSS is the answer. Basically you can tell the blogs you like to inform you you when they’ve changed, automatically, no need to do anything on your part. How cool is that! All you’ll need is a RSS reader, then subscribe to as many blogs as you like and they’ll start to notifying your RSS reader. Simple. If you’re using Internet Explorer 7 or above (and most of my readers are) then everything is already built into the browser. Give it a bash, click on the image in this post. Everyone likes a bit of advertising. Fav my blog on Technorati and you’ll make my day. Technorati is a way of introducing the world to the stuff you like. It showcases good blog content. If you’re a member why not write a review of this site or even an article. Fav this blog and you’ll make my day. People either love or hate Twitter. Maybe RSS seems a bit involved and Technorati like a bit too much effort? Twitter is a good in between. Basically I update my status on Twitter with a short message. I do this when I’ve posted an article or made a significant change to the site, like a new banner or additional widgets in the right hand column. If you’re a follower of my tweets then that message is automatically sent on to you. It’s a “Simple Simon” way of keeping in touch with what I’m doing on the blog. Have you heard of Facebook? It’s like a family braai, except anyone’s invited and everyone has a pocket photo album that they want to share. You can see what’s happening in peoples lives and generally keep up to date with folk. I love it. Checking out what’s going on in the lives of my friends is my favorite online activity. Any other follow/track me things I should be using?